Arms – Barry wavy argent and azure, three pilchards hauriant proper, all withing a bordure sable charged with eight bezants. 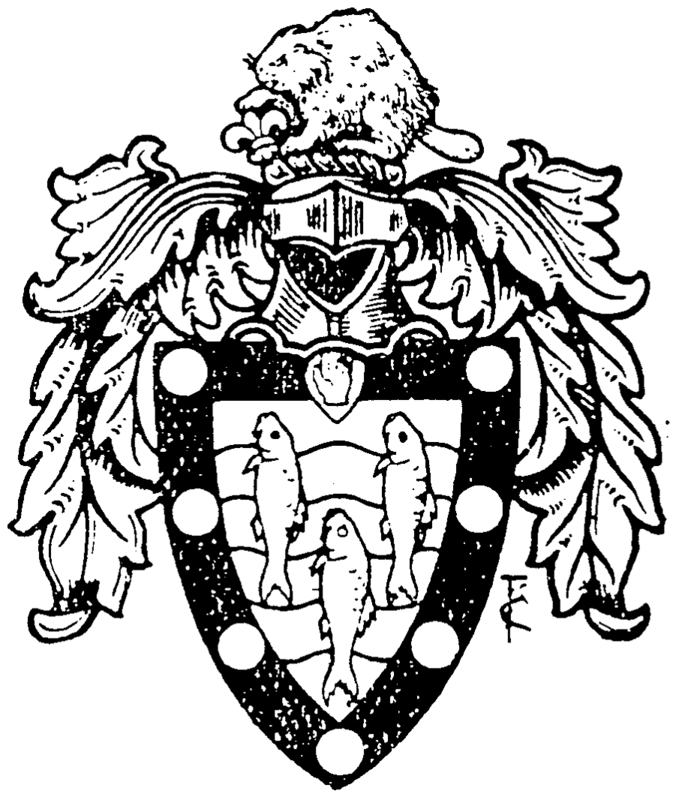 Crest – A beaver proper resting the dexter foot on a fluer-de-lys or. Motto – Dii laboribus omnia vendunt. In non-heraldic terms, this can be described as blue and white wavy bars on which are three pilchards in their natural colour with their heads upwards, all within a black border covered with eight gold discs. Above is a beaver in its natural colour with its right paw on a gold fleur-de-lys. The barry wavy is a common heraldic motif, and in blue and white it represents water. It appears on the arms of the City of Oxford, representing the ford in the Isis, and may be a reference to Osler’s Oxford association. It may equally represent the Atlantic Ocean which divided his two countries of residence, or possibly the river Fal. Osler’s family came from Falmouth, and the pilchard is a type of herring found mainly off the coasts of Devon and Cornwall. The Rev. Featherston Osler, Sir William’s father, went as a missionary to Canada where he was minister of Ancaster and Dundas, Ontario 1857-93. 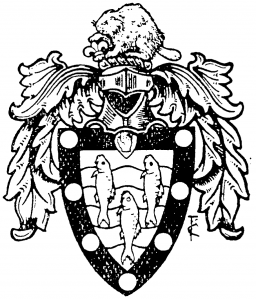 It is interesting to note that the arms of the Ancaster family comprise a red and white barry wavy with three herrings hauriant (head upwards). Osler himself enjoyed angling: in 1908 he went fishing with his son Revere in Scotland. The bordure and bezants are common heraldic devices but the bezant is sometimes used to represent a pill. In this context three bezants feature on the Medici arms, an obvious pun on the name. They may be fulfilling a similar function here. Above the shield is the helm with vizor raised affronty, ie. an open-vizored helmet viewed from the front. This represents the steel helm of a baronet and is not mentioned in the heraldic description since it is common to all baronets’, and knights’ arms. Although beavers had appeared in older heraldry, they were semi-mythical beasts, scarcely recognisable as beavers and often in unfamiliar colours such as blue or green. The beaver in its natural colouring is a comparative newcomer to heraldry. It has been introduced into many recent coats of arms of those in any way connected with Canada. The golden fleur-de-lys is a familiar royal symbol when shown in triplicate on a blue field, but a single one denotes a sixth son. Sir William Osler was the sixth son of Rev. Featherston Osler. These arms are now extinct since Osler left no living male heir. By using them for the tie, the Club is keeping fresh another facet of Osleriana.